I’m grateful for the insight from some truly incredible tools that help make sense of the actions I take on social media. How have my followers grown this month? Which posts seem to perform best? Which times make the most sense to post? The answers are out there, and there are tools to help you find them. We are presenting to you one of our favorites here in this post. StatiGRAM is an analytical tool that provides its users with accurate data and behavioral statistics about their Instagram profile. Developed by Benicio Apps and brought to the Android platform, this app is very user friendly and designed with clean user interface. Let’s discuss it. StatiGRAM is all about your Instagram profile statistics. It features more than 30 analytical tools that will make it easier for you to keep in touch with your Instagram profile’s life. Whether you’re interested who are the admirers of your profile or who isn’t following you back, this app has got you covered. 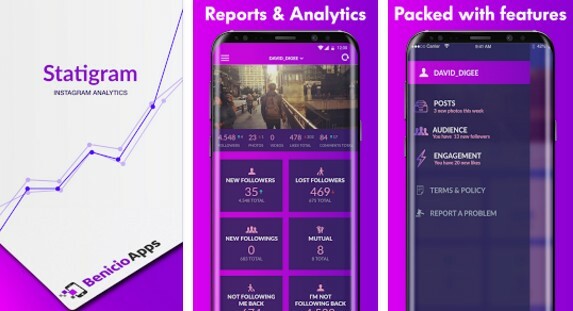 Here are some other features that the app includes: new followers, lost followers, users not following you back, most engaged photo and video of the week, ghost followers, least given and most given photos, users you have unfollowed, earliest followers, and so much more! Have detailed reports and analytics, download the StatiGRAM app for free from Google Play and enjoy.